Christmas is coming.... | Memorable Days : Beauty Blog - Korean Beauty, European, American Product Reviews. It looks like Christmas is almost coming ^_^! 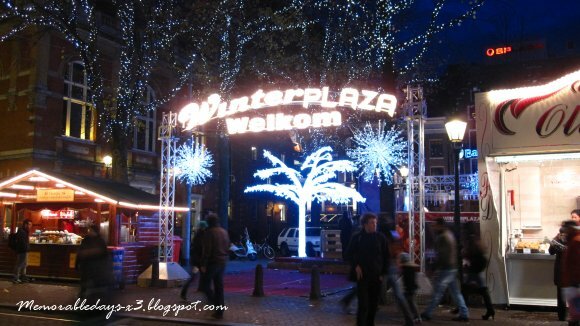 It's not even Christmas yet and there are many decorations, like Christmas lightnings and trees already at the city center in Amsterdam^^! It looked so pretty. People could also ice skate there. And it smelled delicious at the city center as well! They were selling oliebollen, waffles and gluhwine. 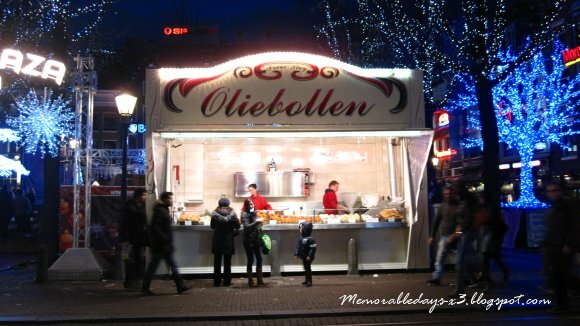 Oliebollen is a traditional Dutch food. Sometimes it is referenced in English as a Dutch donut. According to wikipedia: "Oliebollen are a variety of dumpling made by using two spoons to scoop a certain amount of dough and dropping the dough into a deep fryer filled with hot oil. In this way, a sphere-shaped oliebol emerges. The dough is made from flour, eggs, yeast, some salt, milk, baking powder and usually sultanas, currants, raisins or sometimes people will put apple piece in it." Do you eat something special during Christmas at your country? Warm and sweet feeling from these pics?Check! We eat kourabiedes and melomakarona! @kyandi, nog nul =p, nog geen tijd gehad om het te gaan halen haha, dit hoor je rond kerst te eten he.. :P maybe next month haha^^ jij dan?? We eat panettone ! But for my Belgian family side, there's nothing special... maybe oyster ? @morgane, they sell panettone here as well xD haha oyster? Don't they eat it during new year =o? wow it,s pretty! Here, it's getting start to put christmas decoration. I haven't eat anything special yet. i already did my shopping!